It snowed again this morning – only a dusting but it is still very cold. I went grocery shopping and then to the hairdresser. We are not going out tonight. I am cooking prawns in tempura batter. I don’t want to go out when it is so cold – nicer to stay in by the fire. John is going to buy a new car. He is such a ditherer. He has finally decided on a Mercedes Estate but is now hovering about buying brand new or second hand with low mileage. When I want something, I know immediately what I want – no pouring over magazines and web sites.It’s a wonder John ever gets dressed – he agonises about which colour socks to put on every morning. Me, I just put on the first ones that come to hand – often not even a pair! Maureen, Susan, Kessa and Theresa all solved the Otter question – now we will have a word search. An art gallery has an octagonal room where paintings of big cats are displayed.One painting hangs on each wall. Can you determine which cat is on which wall? 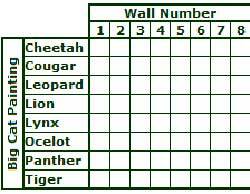 The cats are Leopard, Tiger, Lynx, Ocelot, Lion, Panther, Cheetah, Cougar. 3. The ocelot, that is two places clockwise from the tiger, has two letters in common with the cat diagonally opposite. 6 The cheetah is positioned two higher than the lion, which has one letter in common with the cat diagonally opposite. Answers to jannette@easynet.co.uk with Cats as subject by Monday midnight please. Now I am going to make an apple and blackberry pie for lunch tomorrow!